The 1948 John Huston classic The Treasure of the Sierra Madre takes place in Mexico, where two beggars decide — after some unsuccessful ways to make money — to prospect for gold, but for the precariousness of such a venture with the help of an expert named Howard. From the first minutes I began watching this film, I have to say it was appealing. Even though I had low expectations, the more I was watching, the more interested andengaged I began to feel. It helped to learn some details about gold prospecting during the era and I was surprised by all the knowledge of both original author B. Traven and John Huston who adapted it. I believe it the idea of how wealth can gradually corrupt the human mind was well expressed in the way the protagonists quarreling after finding some gold, while at the same time they have to protect themselves from thieves and others who would want a part of their newfound fortunes. No one is to be trusted and this idea starts haunting them. Fred Dobbs (Humphrey Bogart) is a drifter who has a poor lifestyle and wants to make some money because he feels like an outsider, and afraid and homeless American in Mexico. Financially exploited by an American oil rig entrepreneur, he and Curtin decide to search for gold with the guidance of Howard. Curtin (Tim Holt) belongs to the same financial class with Fred and although he is not innocent, he proves to be the opposite of Fred, managing to remain calm and logical. Howard (Walter Huston) is the sophisticated one of the group, not only giving the other two directions about the gold prospecting procedure, but also life lessons. He knows from personal experience how wealth can ruin people’s morals and relations, so he warns them from the beginning of the mission. At the start he manages to balance the thoughts of the other two and gives them advice. He gets along better with Curtin than Fred. Cody (Bruce Bennett) is a hunter who was providing for his wife. After noticing some suspicious behavior of Curtin at the beginning, and then of the other two, he decides to join them and share the gold. The Gold Hat, who are thieves that are chased by Federales. They torture the protagonists from beginning to end, as they covet their animals, goods and potential riches. Every day villagers, who appear full of customs living another way of life and rewarding people who help them out when in need. Performances in The Treasure of the Sierra Madre were very good in general, with my favorite being that of Humphrey Bogart ( Fred) and Walter Huston (Howard). They managed to succesfully convey the thoughts and feelings of the characters. I did not anticipate that the direction of the film would be as great as it was. There was a combination of more relaxed and tense moments and the viewer completely becomes one with the protagonists and feels the suspense emotions that are triggered. Even if it might not be expected by somebody who has read the summary only, it indeed incorporates many techniques used in film noir. John Huston did a very good job in a technical and scriptive way. Cinematography of Ted D. McCord is centered very much around natural elements. We see many landscapes of vast, barren lands and mountains, the change of weather, like gusting winds moving the sand, which can be used as a symbol of transience. There is also a scene with a reflection of a human next to a lake. The ending was a real surprise, but in a positive way, as it adds up to the film’s epic scope. 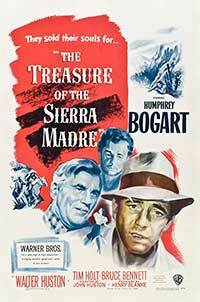 Two out-of-work Americans get an old prospector in Mexico to help them search for gold in the Sierra Madre Mountains, which eventually leads to lots of mistrust in this 1948 John Huston classic starring Humphrey Bogart that offers up a goldmine of treasures decades after its release.